09:00 Arrive the pier and depart to Coral Island. 09:20 Relaxing, Swimming, Snorkeling and water sport playing. 13:00 Buffet Lunch on Coral Island. 15:30 Back to the Pier and transfer by Van to the Hotel. 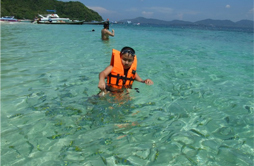 Remark : The price is included Snorkeling equipment, R/T Transfer from the hotel, Soft Drink, Snack and Lunch.